In 2009, I had pain in my left lumbar back - at the waist, not the kidneys. The doctor took a urine sample, but I had NO SYMPTOMS of a UTI - NOT ONE! She never told me the results, and I've been trying to get a copy of the lab results from the hospital for 2 years (they can't find it); the doctor prescribed Levaquin; the pharmacist, when I went to pick it up, said, "This is the strongest stuff!" Scared me since I'm normally a naturopathic patient, so I went online to see what it was I was taking, shortly after beginning the regimen prescribed. Well, about the same time, I woke up with the worst backache (in both kidneys) and had to call my son to take me to the hospital (a different one 20 miles away, please! )The emergency doctors there gave me an injection for pain, and also "supposedly" took a urine sample, and then prescribed Cipro. Within a few days or weeks, I had spasms in one calf, which continue to this date (not anaemic, good hemoglobin), and constant pain throughout my body. My left wrist has been sore and sometimes useless (had to buy a brace in the grocery store so I could push a grocery cart the other day) for two and a half years, without any external injury. I am a 65 y.o. minimally-self-medicating woman because I am not wealthy enough to pay a doctor, and went to a public hospital before I qualified for Medicare. Then I went to private doctors and a private hospital to get relief from the growing debilitations in my previously healthy body. The ORIGINAL LEFT BACK PAIN TURNED OUT TO BE my left psoas muscle, not my kidneys. The minimum pain, after two years, has magnified, and now both the left thigh and knee have been contracting and weakening since the Levaquin, without relief after physical therapy. Walking is a guessing game. Sometimes, my knees give out suddenly, some days, not. (not arthritis) Sometimes, my balance is thrown off if I turn a corner too quickly. Sometimes, my shoulders and neck hurt for no reason. Heat, creams, yoga, stretching - nothing helps. Two months ago, doing absolutely nothing but standing in my home, my right "breast/chest muscles" felt like they just spontaneously tore away from my scapula bone. New orthopaedist did x-ray (for soft tissue??? ), showed nothing. Wanted to give me an injection for the pain. No thanks! Then, last month, my right bicep felt like the muscles spontaneously ripped from my rotator cuff(sp? )and that arm is useless for tasking like lifting or reaching. I had to drop out of my exercise class because the pain would not allow me to raise both arms. I have constant pain through the middle of my brain, and sometimes, even the muscles holding my eyes are sore...I don't have diabetes, cancer, any disease, or heart problems, but sometimes my lungs feel like they are collapsing or "pulling". to die to stop the pain...I don't trust medicine, especially since that ortho got angry I did not fill the prescription for Neurontin (which is for people who have seizures) - prescribed for my muscle pain - "neuro", "neuron", are you kidding?????? ?scared, yes! The only thing I can do is to cry out of anger that my primary and ortho seem to think I am seeking attention or just trying to find a legitimate outlet for socializing or something crazy - they say "it's part of growing old" - but I've not lived a rough life, I've always been healthy, eat healthy, and love cold weather (while my peers bundle under blankets in winter. I don't know where to turn...I have never been a beggar or complainer, but rather find solutions on my own, but I'm so tired of the pain. You didn't leave your email or check the notifications box, so I hope you find this response. I'm so sorry you've had that experience. Having said that, I'm not at all surprised at your description of events. Doctors are culturally invested in the pharmaceutical world. They don't like to admit that possibly something they prescribed caused problems. And they don't educate themselves from anything other than the info they are given by the pharmaceutical industry. My evidence for having this opinion? 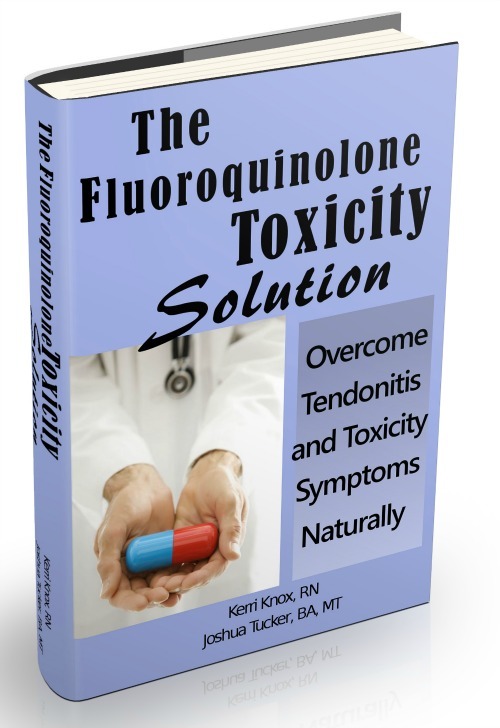 There is SO much research out there, and so much Levaquin horror stories out there, that 5 minutes on the internet would give them all the information that they need to know the dangers of fluoroquinolones. Physical Therapy doesn't have a hope of helping you, as it's not an exercise thing. It's much deeper than that. It's all chemical, in the sense that the 'problem' lies in your nutritional/chemical make up. That's what causes the physical damage and pain. Doctors tend not to understand that concept. They're trained to look at and combat symptoms, as opposed to look at how the body works, and find what isn't working correctly that is causing symptoms. Levaquin Tendonitis and your other described symptoms are primarily caused by the mass depletion of Magnesium caused by Levaquin and Cipro. You need to focus on refilling your body. There's other nutritional issues as well, but that's a cheap/easy one to factor in, which is why I suggest that you get The Levaquin Tendonitis Solution ebook. If you find this response, let me know, and we'll chat more.